I have been with Master Takaya Yabiku of OKINAWA MATSUSOKAN TRADITIONAL KARATE since 1989 as the Director for Germany. I am now the Representative and Chairman for OKINAWA MATSUSOKAN TRADITIONAL KARATE USA, and EUROPE. Before joining Matsusokan I was with Ron Lindsey, the former Director of MATSUMURA KENPO USA, under Master Yuichi Kuda. 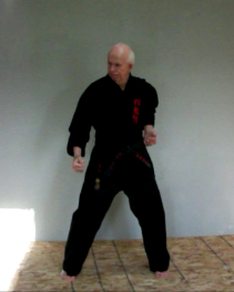 Master Lindsey is very informed on Matsumura Karate and Kobudo. I enlisted in the US Marine Corps at the age of 17 and was sent overseas to Okinawa. 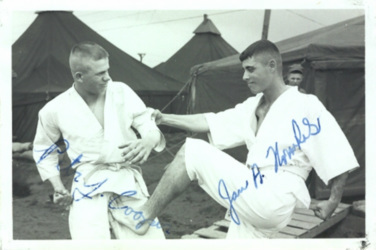 I started training in Judo first in 1964 with Gunnery Sergeant Rodriguez my Section leader, he was the Marine Corps Judo champion. I switched to Karate, because I got tired of being thrown around, I only weighed 125 pounds to light to throw others around. I saw a Karate dojo in Kin Village so I decided this was better for me then Judo. In1964 at the age of 17 I started with ISSHINRYU under Tatsuo Shimabuku Sensei at the Kin Village Dojo, it was free the Marine Corps paid for it. This is where I met Master Advincula for the first time he and a red haired blackbelt were working out to the right of the entrance inside the dojo, the red haired blackbelt was complaining to Master Advincula that he was blocking to hard. While Stationed at Camp Hansen Okinawa as a Marine and my name at that time was "Cooper". I did not train directly with Tasuo Shimabuku Sensei, I was a new student, and that training for new students was done by Sensei John Bartusevics at the time I was there. While I was training at the Dojo we watched a film of Tatsuo Shimabuku's visit to the USA. I am also a member of the ISSHINRYU WORLD KARATE ASSOCIATION under Master Kichiro Shimabukuro, Sensei Tatsuo's first son. 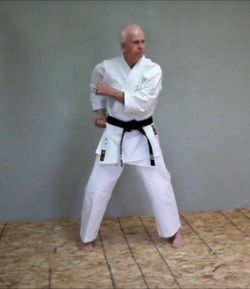 During the same time I was studying Karate at Kin Dojo I was also instructed in karate at the Camp Hansen Gym by an Okinawan Karate man whose name I do not remember. He worked at the Camp Hansen Snackbar. In exchange for teaching me he asked to borrow my book on Karate by Mas Oyama, so that he could learn the English words for the Karate techniques. I never did get the book back. I continued my studies in 1965-67 with Master Eizo Shimabukuro Sensei of SHOBAYASHI SHORINRYU brother of Tatsuo Shimabukuro at the Henoko Dojo in the Village of Henoko Okinawa while stationed at Camp Schwab. Other Sensei's I have trained with by either attending a Dojo as a student, or through Seminars were as follows: ISSHINRYU Master George Shin, at the Puyallup Grange Dojo Puyallup Washington. Master Yuichi Kuda of MATSUMURA KENPO. Marines that I was stationed with both at Camp Pendleton, CA and overseas. The photo on the left is me with my training partner in Japan 1964.